IT Field Technicians are accountable for providing customer support mainly through field visits. 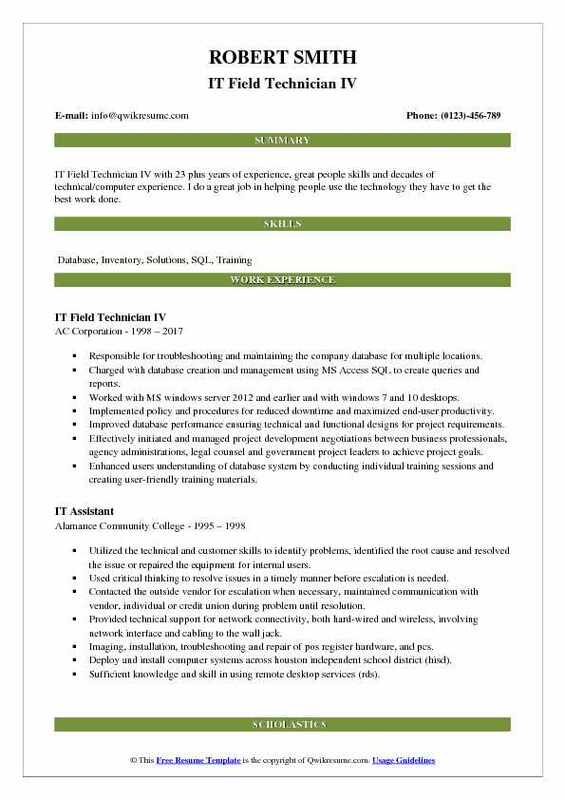 The typical duties listed on successful IT Field Technician Resume are – identifying technical issues, installing hardware, software and network systems; upgrading computer applications, determining solutions to technical issues, writing service reports, answering to client’s inquiries, ensuring security and privacy of computer systems and networks, carrying out maintenance and upgrading tasks, maintaining logs of repairs and fixes, and adhering to company policies and procedures. The ideal candidate applying for this role should be able to demonstrate skills such as – proven work experience in the related field, outstanding diagnostic and problem-solving skills, excellent understanding of various computer systems and network, solid knowledge of internet security and data privacy principles and high-level of troubleshooting and servicing skills. Employers normally consider a technical certificate and a good amount of work experience over an academic qualification. 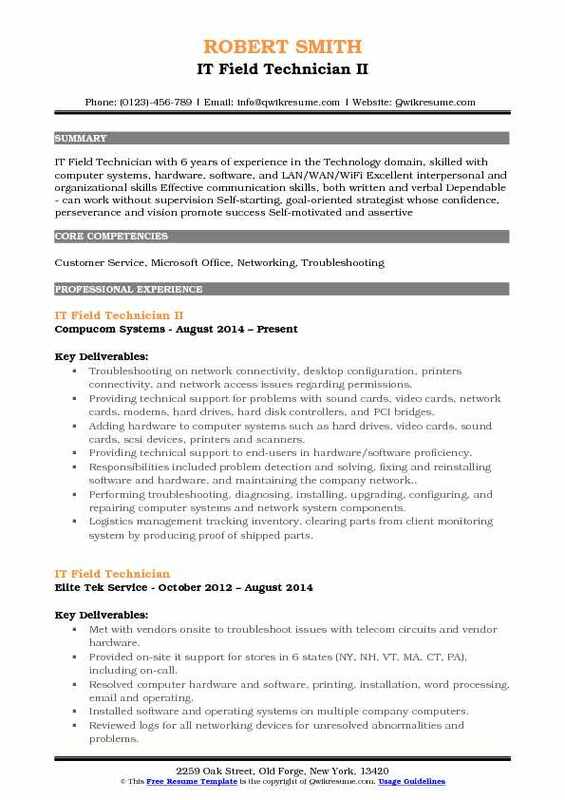 Summary : Accomplished and Goal-Orientated Senior IT Field Technician with 8 years of experience, excellent troubleshooting and technical support abilities Experienced in Workstation Rollouts and Operating System Imaging Productivity Improvement Operational Leadership. Providing general to advanced desktop support for the domain and non-domain attached systems, desktop/laptop systems, and peripherals. Providing IT support to 3 locations for desktop support, for PC and Mac systems in an active directory environment. Also providing support for Google user and device. Account setup and management of HBCSD chrome book devices and e-print servers. Utilizing the tech-help ticket support system for ticket management and tracking of support. PC imaging using clone-zilla software to single machines or to a subnet/network. Providing network documentation of all routers, switches, IP speakers, access points, and IP phones. Documentation of IP addresses, model numbers, serial numbers, login credentials, vendor information, the specific location of each device, and Visio drawings both logical and physical. Providing PC support during SBAC state field testing. Also providing PC and printer support which includes PC imaging, troubleshooting, workstation setup. Providing in-house admin IT support at the corporate office as well as assisting with monitoring all of our in-house servers using Nagios, Cisco log analyzer, Veeam. Objective : Junior IT Field Technician with two plus years of experience is seeking challenging, fast-paced position as a Unix / Linux / Windows Systems Administrator / Network Administrator / Desktop Support. Highly knowledgeable in configuring and troubleshooting hardware and software. Skills : Office 365: SharePoint 2010 (Cloud), Exchange Server And Microsoft Lync. Server: Windows Server 2008, 2013, Exchange Server 2010, PBX Server. Operating Systems: Windows XP, Windows 7, And Windows 8. Software: MS Office Suite, Adobe, Malware Bytes, Symantec Backup Exec, VPN. Networking: TCP/IP Protocols, Peer-to-Peer Networks, Wireless, LAN/WAN Hardware: PC-Based Desktops, Laptops, Printers, Blackberry And IPhone Configuration. Remote Support Software: Team Viewer, Remote Desktop Support, LapTech Remote Monitoring. Monitored and checked logs for all the domain controller servers include exchange 2010 server, backup servers etc. Set up and provided day-to-day end-user support through email, RDP, and telephone support in a highly collaborative team environment. Created/removed/enabled active sync/reply email/blacklist/whitelist and moved data on exchange server 2010 and troubleshoot. Configured email account on the outlook on the laptop, PC, tablets and smartphone. Created and managed email account on hosting controller, Rackspace, and GoDaddy. Changed hard drive and scheduled the backup using Symantec System Recovery 2011/Windows backup and restored server re/installations, configurations, managed and troubleshoot. Created group policy for the user/group as required by the organization to secure their network. Setup/installed/configured new Dell PC, Dell laptop, tablet, and smartphones. Contacted the hardware and software vendor representatives to solicit and arrange product repairs. Drove to the client’s site in DC, MD and VA for the monthly maintenance/troubleshoot/backup the data. Implemented company policies, technical procedures, and standards for preserving the integrity and security. 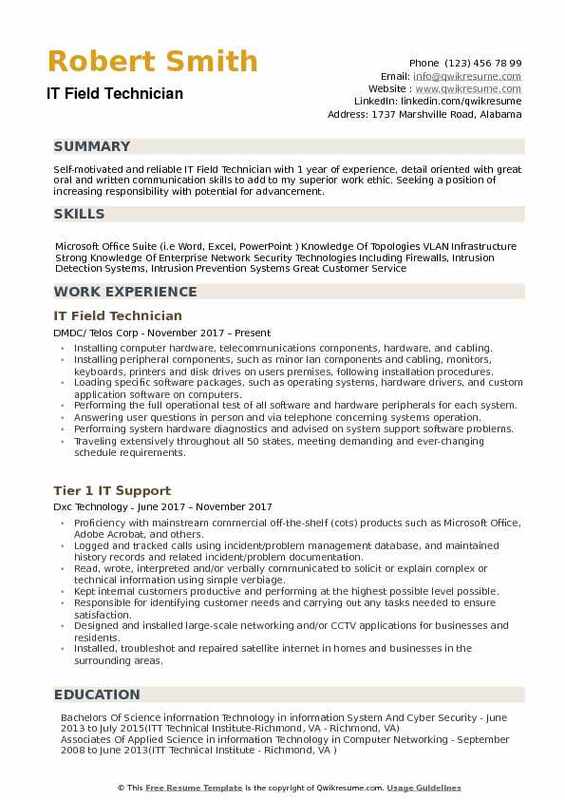 Summary : IT Field Technician IV with 23 plus years of experience, great people skills and decades of technical/computer experience. I do a great job in helping people use the technology they have to get the best work done. Responsible for troubleshooting and maintaining the company database for multiple locations. Charged with database creation and management using MS Access SQL to create queries and reports. Worked with MS windows server 2012 and earlier and with windows 7 and 10 desktops. Implemented policy and procedures for reduced downtime and maximized end-user productivity. Improved database performance ensuring technical and functional designs for project requirements. Effectively initiated and managed project development negotiations between business professionals, agency administrations, legal counsel and government project leaders to achieve project goals. Enhanced users understanding of database system by conducting individual training sessions and creating user-friendly training materials. Experienced in providing energetic and professional training to diverse audiences and learners. Skilled at assessing individual needs and providing one-to-one teaching solutions. Assisted managers in assessing and developing software solutions for department needs. 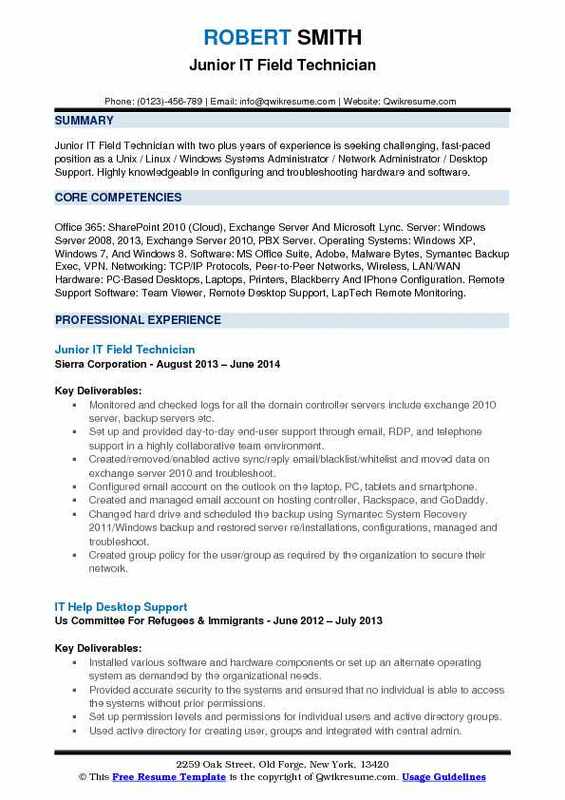 Experienced and resourceful in assessing and fixing computer and network problems at multiple locations. 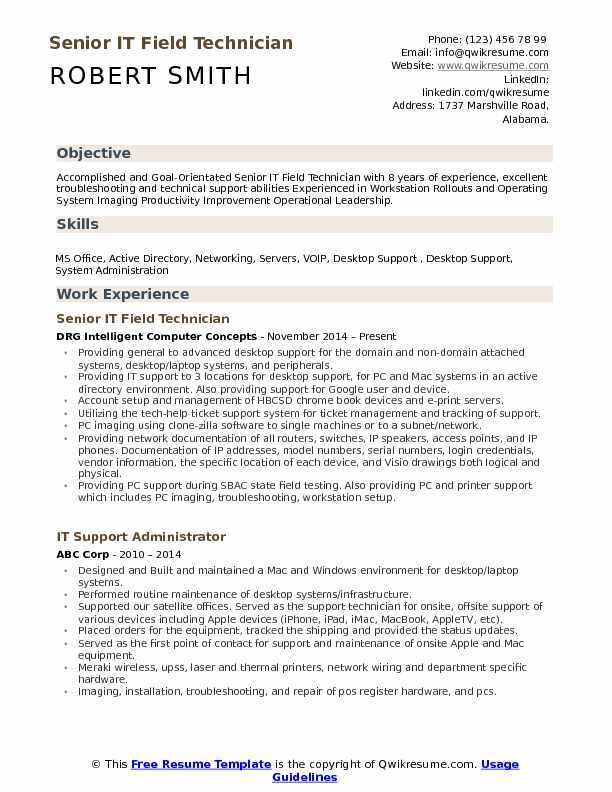 Worked with, and highly skilled at troubleshooting operating systems, various software, LAN, and WAN issues. Objective : IT Field Technician with 2 plus years of experience in the Retail domain is seeking to work in a challenging and stimulating environment that is interactive and multi-faceted. Obtain a position with a progressive company that will give me the opportunity to put into practice all my knowledge, skills and develops new ones. Provided technical assistance and support for incoming queries and issues related to computer systems, software, and hardware, to McD, Popeye, Soft and Creamy, ACAI Express, Wendys, Eye Center, Los Gorditos Rest. Designed and installed well-functioning computer networks, connections, and cabling. Performed troubleshooting to system failures and identified bottlenecks to ensure long-term efficiency of the network. Tested, configured software maintained and repaired hardware and peripheral devices. Organized, scheduled upgrades and maintenance without deterring others from completing their own work. Provided technical direction to co-workers on the computer and network usage. Troubleshoot computer software and hardware issues, and made repairs and performed scheduled updates. Partner with the IT team to ensure that security software is properly installed on employee computers. Provided technical support to clients through various channels of communication. Inspected cable lines to ensure that they are intact and working optimally. Attended regular team meetings and participated in projects discussions. 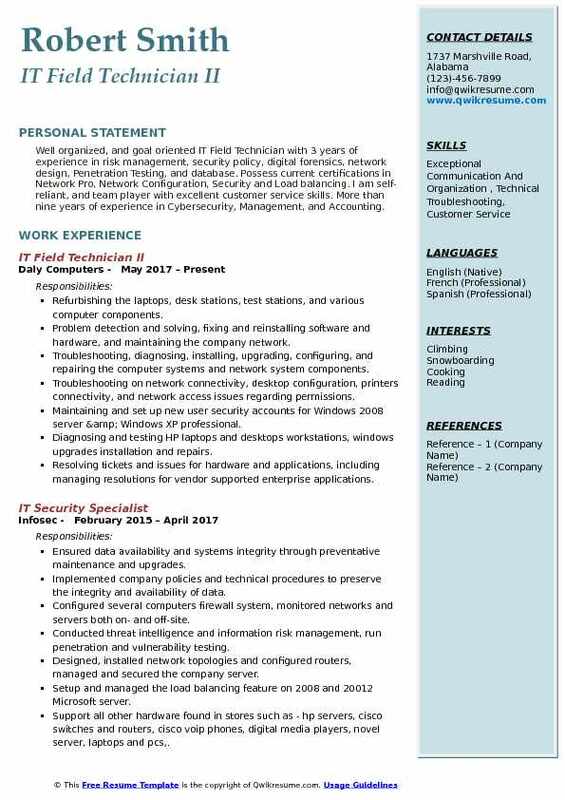 Objective : Well organized, and goal oriented IT Field Technician with 3 years of experience in risk management, security policy, digital forensics, network design, Penetration Testing, and database. Possess current certifications in Network Pro, Network Configuration, Security and Load balancing. I am self-reliant, and team player with excellent customer service skills. More than nine years of experience in Cybersecurity, Management, and Accounting. Refurbishing the laptops, desk stations, test stations, and various computer components. Problem detection and solving, fixing and reinstalling software and hardware, and maintaining the company network. Troubleshooting, diagnosing, installing, upgrading, configuring, and repairing the computer systems and network system components. Troubleshooting on network connectivity, desktop configuration, printers connectivity, and network access issues regarding permissions. Maintaining and set up new user security accounts for Windows 2008 server & Windows XP professional. Diagnosing and testing HP laptops and desktops workstations, windows upgrades installation and repairs. Resolving tickets and issues for hardware and applications, including managing resolutions for vendor supported enterprise applications. Using SIEM technologies and other native tools to perform the monitoring of security events. Performing the technical analyses, such as analysis of malicious code, network traffic, web log data, cyber intelligence, hard drives, and other storage and forensics media, to control exploitative activity. Performing ongoing assessment and authorization projects in support of client security systems and ensuring quality control of A&A documents. 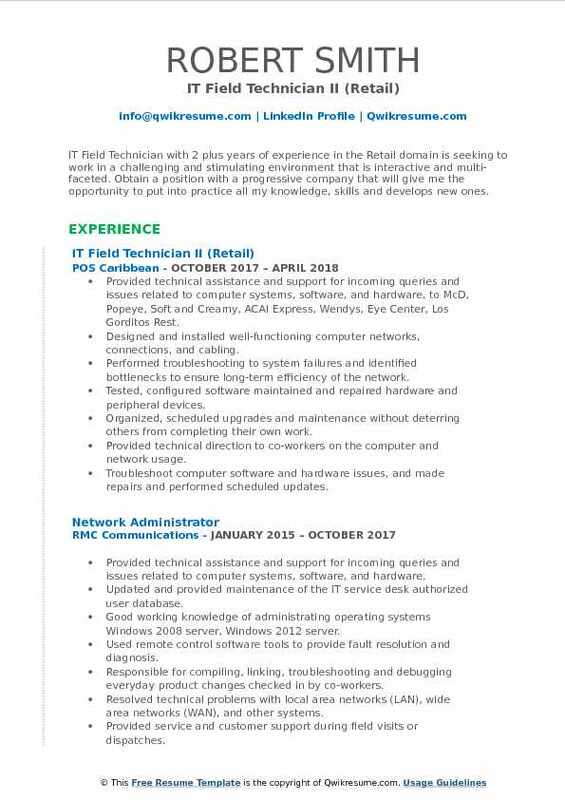 Headline : IT Field Technician with over 6+ years of experience in multiple areas including Break-fix for Laptops and Desktops, Hardware Migration, Etc., Provide Business and Residential Customer break-fix, hardware installations for Dell Computers on both Desktops, Laptops Extensive support of HP, DELL, desktop, laptops & printers, and scanners. Performed desktop and laptop repairs for HP Compaq, Dell and NCS systems. Providing business and residential customer break-fix, hardware installations for Dell computers on both desktops, laptops. Diagnosing and troubleshooting the computer systems and printers, replace motherboards (desktops & laptops), DC ports, hard drives, etc. Responsible for the maintenance of computer hardware and software systems. Installing operation systems, troubleshooting of hardware and software problems. Image new laptops and desktops to company's Windows XP/ 7 / 10 operating system. Diagnosing, installing, and configuring PC desktop and laptop hardware, software applications, operating systems. Troubleshooting and resolving the internet connectivity problems, in support of workstations, printers and other devices. Adding, upgrading, repairing wireless networking capability to desktop and laptop PCs. Providing technical input and compliance perspective during the cross-site team meetings to maintain accountability. Troubleshooting issues and problems with monitoring products and dealt with vendors on negotiating licenses, and contract terms. 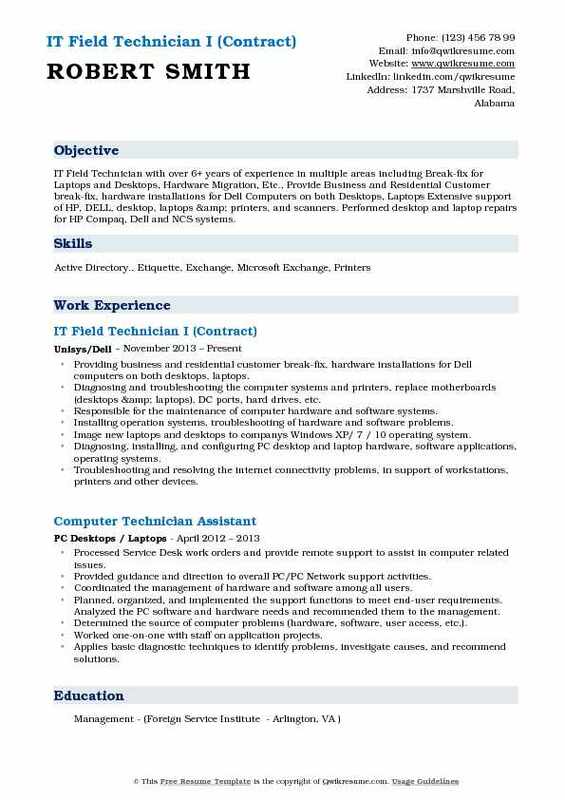 Objective : IT Field Technician with 5 plus years of experience in Education domain, a hard-working, persistent, organized individual seeking a firm what will best use my degree, experience, and skill set. Worked closely with other departments/organizations and collaborating with other IT staff. Utilized solid communication skills with the senior immediate supervisor and/or higher levels of management. Worked with hardware and software dealers to confirm well-timed product delivery. Installed and configured 10 facilities each facility has 3 units workstations/laptops while providing IT support to all students to ensure efficient system usage. Enhanced remote access through installation, configuration, and troubleshooting of VPN, remote desktop. Improved stability and performance of system and network up to 50% by upgrading Windows XP professional to Windows 7. Saved all student data on existing pc, migrated existed applications, and customized configuration settings. Installed, configured, troubleshoot and supported multiple virus/malware software and removal tools. Automated the ticketing alert/notification from all monitoring products. Connected all monitoring products with our ticketing system (CA service desk management). Ran penetration and vulnerability testing using Nessus and Kali Linux. Installed and secured network and configure routers, switches, firewalls, servers and topologies. Providing technical support for problems with sound cards, video cards, network cards, modems, hard drives, hard disk controllers, and PCI bridges. Adding hardware to computer systems such as: hard drives, video cards, sound cards, scsi devices, printers and scanners. Providing technical support to end-users in hardware/software proficiency. Responsibilities included problem detection and solving, fixing and reinstalling software and hardware, and maintaining the company network.. Performing troubleshooting, diagnosing, installing, upgrading, configuring, and repairing computer systems and network system components. Logistics management tracking inventory, clearing parts from client monitoring system by producing proof of shipped parts. I accomplished completing some hp, dell, xerox and lexmark cerificaton. Advising clients on appropriate hardware and software and preventative care. Using remote software for troubleshooting and repairing software issues. 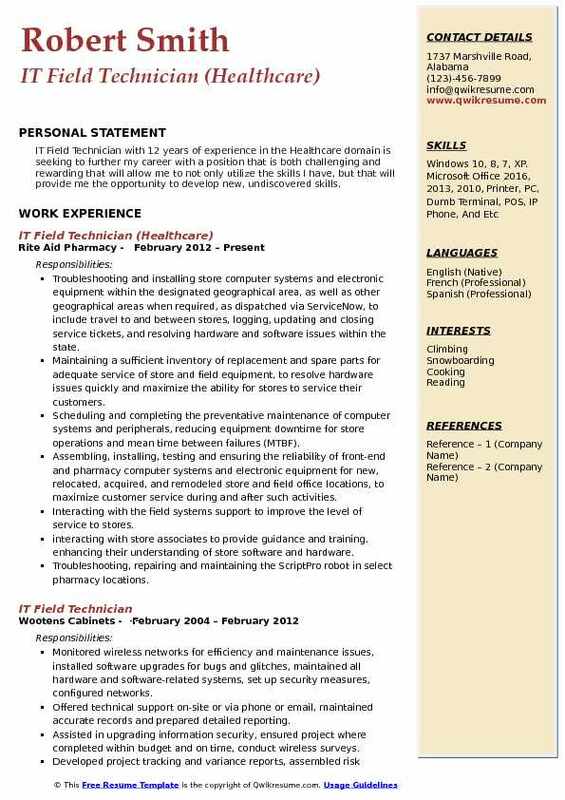 Summary : IT Field Technician with 12 years of experience in the Healthcare domain is seeking to further my career with a position that is both challenging and rewarding that will allow me to not only utilize the skills I have, but that will provide me the opportunity to develop new, undiscovered skills. Troubleshooting and installing store computer systems and electronic equipment within the designated geographical area, as well as other geographical areas when required, as dispatched via ServiceNow, to include: travel to and between stores, logging, updating and closing service tickets, and resolving hardware and software issues within the state. Maintaining a sufficient inventory of replacement and spare parts for adequate service of store and field equipment, to resolve hardware issues quickly and maximize the ability for stores to service their customers. Scheduling and completing the preventative maintenance of computer systems and peripherals, reducing equipment downtime for store operations and mean time between failures (MTBF). Assembling, installing, testing and ensuring the reliability of front-end and pharmacy computer systems and electronic equipment for new, relocated, acquired, and remodeled store and field office locations, to maximize customer service during and after such activities. Interacting with the field systems support to improve the level of service to stores. interacting with store associates to provide guidance and training. enhancing their understanding of store software and hardware. Troubleshooting, repairing and maintaining the ScriptPro robot in select pharmacy locations. 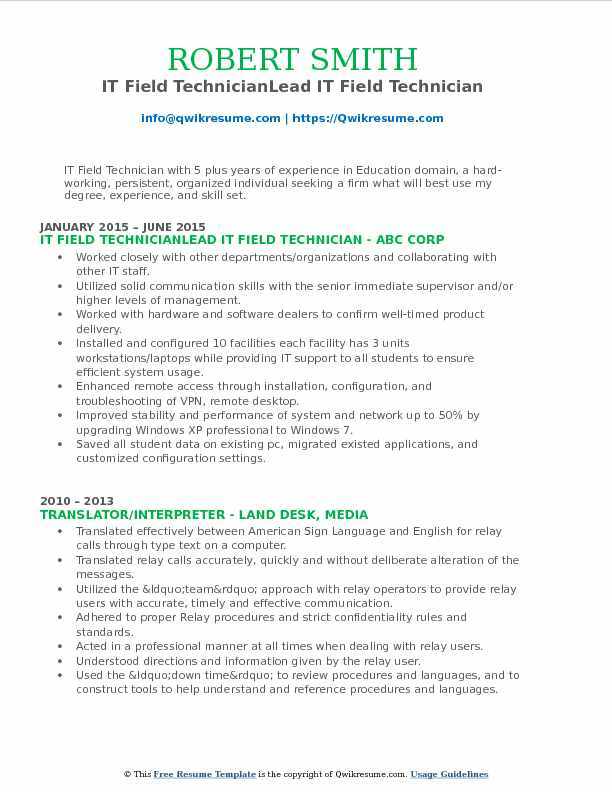 Objective : Self-motivated and reliable IT Field Technician with 1 year of experience, detail oriented with great oral and written communication skills to add to my superior work ethic. Seeking a position of increasing responsibility with potential for advancement. Installing computer hardware, telecommunications components, hardware, and cabling. Installing peripheral components, such as minor lan components and cabling, monitors, keyboards, printers and disk drives on users premises, following installation procedures. Loading specific software packages, such as operating systems, hardware drivers, and custom application software on computers. Performing the full operational test of all software and hardware peripherals for each system. Answering user questions in person and via telephone concerning systems operation. Performing system hardware diagnostics and advised on system support software problems. Traveling extensively throughout all 50 states, meeting demanding and ever-changing schedule requirements. Utilizing Microsoft Access database to track, update, and report on equipment inventories at each user site visited. Visually inspecting the temperature sensors to maintain the health of servers and network devices.